n7player Music Player is a free app for Windows 8 and 8.1 which allows you to play back music files of variety of formats. The list of supported music file formats is endless, but of them, some of the major ones are mp3, ogg, wav, wma etc. The app has an amazingly smooth animations and feels exceptionally fluid while being used. The app works great on touch screen devices due to its touch screen optimization, and works great on non touch devices as well! 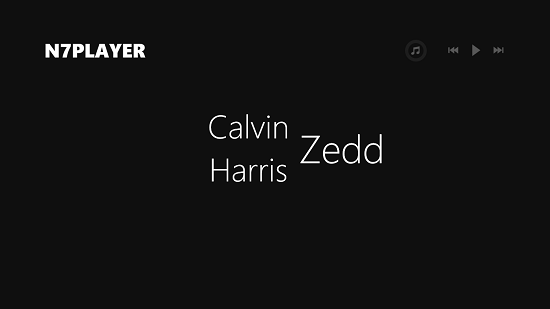 n7player Music Player is available for free from the Windows App Store. When you run the app on your device, you will be presented with an interface which looks like the screenshot below. The app fetches music content from the default Music library on your device. The artist names listed in the above screenshot are the artists whose tracks I have downloaded in my Music library. When I clicked on a particular artist, I was presented with the below screenshot. As can be seen, clicking on an artist name in the main screen of the app reveals the tracks which you have stored on your device by him. 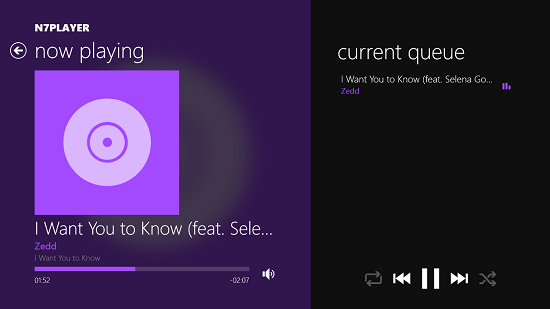 In the above screen I have a sample track of the artist Zedd Ft. Selena Gomez which can be seen with a neat album art preview on the left. Clicking on a track will begin its playback. If you want to go to the detailed playback interface wherein you want to seek the track, you can click on the music icon at the top right corner of the screen, which is conveniently located right next to the pause and fast forward/rewind buttons. 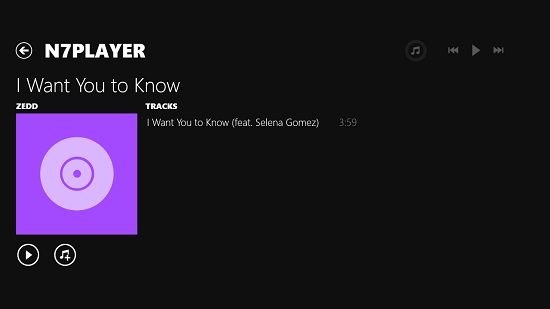 This is a wrap of the main features of n7player Music Player app for Windows 8 and 8.1.
n7player Music Player is a very smooth video player app for Windows 8 and 8.1 and you should definitely check it out!